WEST LAFAYETTE, Ind. 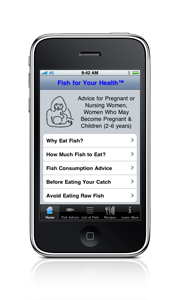 — Information about safe fish consumption for pregnant and nursing women is available from a variety of Purdue University sources, including an iPhone application, Web site and a wallet card. The Fish for Your Health mobile apps and wallet cards let women look up information while they are shopping at the grocery store or eating at a restaurant. Omega-3 fatty acids are essential to brain and eye development, and consuming mercury at high levels can lead to neurological problems. Recreationally-caught fish and fish that is bought in grocery stores or selected in restaurants can contain mercury and PCBs, polychlorinated biphenyls, which are pollutants that can harm the developing brain. Salmon contains high amounts of omega-3 fatty acids, while catfish, tilapia and canned light tuna contain low amounts of the healthy fats. Marlin, shark and swordfish are some of the fish that contain mercury or PCBs at levels that exceed safety standards for sensitive populations, such as pregnant or nursing women, women that will become pregnant, and young children. Information about what fish to avoid, fish that are low in pollutants and fish that are high in omega-3 fatty acids is available at the “Fish for Your Health” site at http://www.fish4health.net. Information about the iPhone applications and how to use the mobile Web site features are available at the site. The “Fish for Your Health” site has recently been expanded to include information specific to individual states, such as advisories about eating fish from the local waters. The Indiana link also includes information specific to each county and information in Spanish. Details about how much fish to eat as well as how to clean and prepare fish also are available on the site. “Our preliminary data suggests that our wallet card encourages women to eat more seafood in part by alleviating their fears of contaminants but also by providing credible information,” Santerre said. The Web site also features a video of Carl A. Behnke, chef and clinical professor instructor in the Department of Hospitality and Tourism Management, demonstrating how to clean and safely prepare fish. The site also includes a video introduction. More than 330,000 versions of the first wallet card have been distributed since 2006. The updated wallet card is currently being distributed in Sea Grants programs, an aquarium in California, as well as in maternity wards, state health departments and Cooperative Extension offices in Florida, Texas, Illinois, Indiana, Massachusetts, California and Rhode Island.